Hebron (Hebrew: חֶבְרוֹן, Ḥevrôn, "league", "confederacy"; Arabic: الخليل, al - Khalīl; Greek: Χεβρών, Hevròn) is a city in Palestine, located in the southern West Bank, about 17-19 miles southwest of Jerusalem, on the main road to Beersheba. Its population is mostly Arabic. An ancient Canaanite city, located in the historical region of Judea, Hebron houses the tombs of Abraham and Sarah, Isaac and Rebekah, and Jacob and Leah. This place is the Cave of Machpelah, a cave acquired by Abraham for use as a hereditary burial place (Genesis 23:17-20 ). Nowadays there is a mosque standing over the cave and entry is forbidden to non-Muslims except under special circumstances. The Jews are allowed to visit the cave only ten days a year. Rachel was buried near Bethlehem. Hebron was a camping place for Abraham (Genesis 13:18 ). ↑ 1.0 1.1 Douglas, J.D. ; Tenney, Merril C, ed. (1987). The New International Dictionary of the Bible. Grand Rapids, Michigan: Zondervan Publishing House. p. 429. ISBN 0-310-33190-0. ↑ Birnbaum, Philip (1979). Encyclopedia of Jewish Concepts. New York: Hebrew Publishing Company. p. 380. ISBN 0-88482-930-8. ↑ 3.0 3.1 "Hebron". 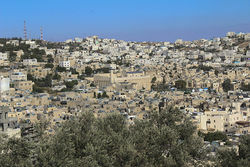 http://www.bibleplaces.com/hebron.htm. Retrieved November 17, 2013. This page was last modified on 5 August 2014, at 16:19.